After trying to teach people about Alpha Channels for several years, I've decided that the biggest source of error and confusion is not understanding what an Alpha Channel, or even a Channel, actually is. Too many people think they are some kind of layer, when the Alpha Channel is an entirely separate thing. So, here's the tutorial I made about Alpha Channel Discovery. This will change, as the site update gets farther along; but if you bookmark this page, the link will stay good. Hopefully, after going through this tutorial, you'll understand what a Channel is, and, I think, all the stuff about Alpha Channels which has seemed so esoteric will suddenly be crystal clear. It's important that you read all the words; don't just look at the pictures. Some of the concepts here won't be found in the pictures alone, and you'll miss a lot if you don't read it, too. So, with out further ado, let's begin. First, let's look at what an Alpha Channel isn't. It's not this. This is Layer Transparency. You can use it to make an Alpha, but it's not one by itself, and it won't translate to one in SL. It isn't this. This is a Layer Mask. It drives transparency on the layer that it's attached to, and that's all it does. It doesn't affect Second Life at all. It's also not this. This is a Vector Mask, also applied to a Layer. You might never have seen one of these, because they are kind of advanced; and that's okay. But just in case you accidentally made one, it's not an Alpha Channel. 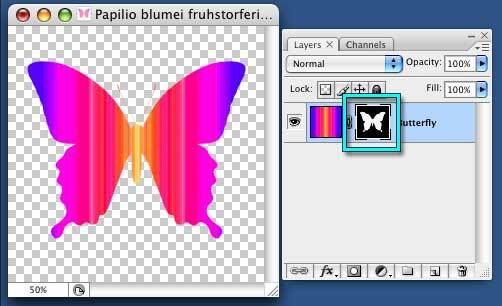 An Alpha Channel is a Channel, and that means that you will never find it anywhere in the Layers Palette. You will only see it if you look in the Channels Palette. In the Default layout, the Channels palette is tucked under the Layers Palette. Find it, and open it now. The RGB slot isn't really a channel itself; it's a composite of the Red, Green, and Blue channels below it. "But," you may ask, "what's the difference between this and the Layers Palette? They look a lot alike." Yes, they do. 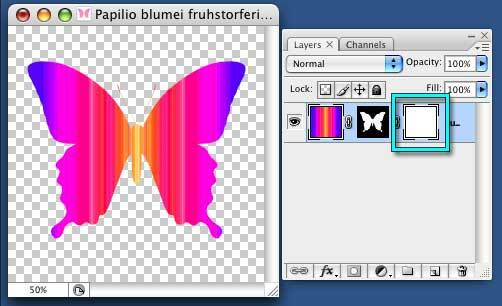 But the difference is that the Layers Palette allows you to put multicolored pixels on transparent layers, and build up your image as if you were painting on sheets of clear plastic laid one on top of the other. The Channels, on the other hand, are grayscale representations of the amount of - something - that is in each pixel of your image. If you're familiar with traditional printing, you can think of them as being like the color plates that determine how much ink is applied to the paper. In a normal, 8-bit RGB image, that grayscale ranges from 0 to 255, giving you 256 possible intensities of each primary color of light for each pixel in your image. Let's play around with that a little, so you can really understand it. 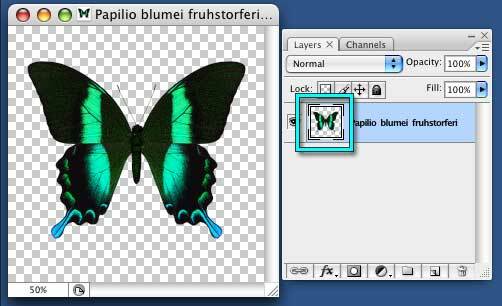 In Photoshop, open a New image. It doesn't need to be very large. I've made mine 256x256 pixels, but you can make yours whatever size you like. Go to the Window palette, to Arrange, and choose "New Window for (your image name, probably Untitled 1)" to open two windows, so you can see what's happening while you play. Move the new window out to the side, so you can see them both at once. Tap D on your keyboard, to change the Color Swatches to the default, pure white and black. 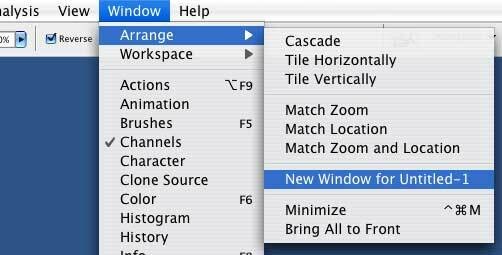 You'll notice that both windows fill at the same time. We are, after all, looking at two views of the same image, and at the moment, those views are identical. 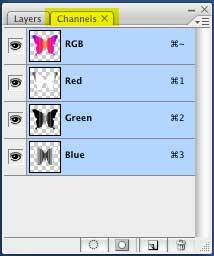 Click on the window on the right, go to the Channels Palette, and click right on the word "Red", in the Red channel. You'll notice that the other channels no longer have eyeballs next to them, and are no longer Selected (no blue highlight.) We are now looking at just the Red channel in the window on the right, and at all the channels in the window on the left. Click X, to swap the Foreground and Background colors, so you'll be painting in white, and grab the brush tool. Now, draw a squiggle in the window on the Right. Don't be afraid; this is just an experimental piece, and you can't do it "wrong." Squiggle any kind of mark you want. As soon as you lift the brush, and the other window refreshes, you'll see your mark. But it's Red! Click here to go to the next page, and we'll explore this farther.